Navigation is important in making a website user-friendly. Your potential customers or clients don’t want to spend a large amount of time searching your site for the information they are looking for. If your website doesn’t present an efficient way to get visitors to the information they are looking for, they will quickly leave your site without exploring what your company has to offer. SEO user navigation is not just about using keywords in a menu, but also about user friendliness as getting visitors to explore the website improves rankings in Google. Here are some tips to help make your navigation bar or menu SEO friendly as well as user friendly. Your main content, including navigation menus, should be text-based. This not only helps Google crawl and index your site pages, but also keeps things clear for users to navigate. You also want to set a limit of how many items will be listed on your navigational bar. Too many items can be confusing for the visitors. Dropdowns can be created to list some similar pages under the main menu item, but don’t have more than one level of dropdown menus. In other words, don’t have a dropdown menu within a dropdown menu. This is where your taxonomy from your keyword analysis comes into play. A taxonomy is basically a classification or grouping of similar items. Your keyword taxonomy would be grouped by product or service with a broad yet descriptive keyword heading up each grouping. Broad keywords tend to get higher volume, though for your navigation they also have to be descriptive enough to attract visitors who are looking for the content or information provided on your site. If the keyword is too broad, you could get visitors who were looking for something different and they will leave your site soon after clicking on the first page. “Services” is too broad as users generally do not search for just “services.” This keyword does not tell the visitor or search engine what the page is about and is a missed opportunity for ranking a useful keyword. Schema is Structured Data Markup. It is the language the search engines use to communicate with a site and determine the information available on each page. Schema can be used to make it easier for both search engines and potential visitors to see what your site is about. Schema can also help show “rich snippets” in the search results such as answers to questions, ratings for products or services, author, date of publishing an article, location, etc. These rich snippets could help greatly, especially if you have high ratings for your products and services. If you’re not familiar with coding, you can use this schema tool by google to come up with the code for you. Schema is expected to continuously grow in importance as voice search increases in popularity since the search engines can only provide one answer for a voice search. Breadcrumbs help users see where they are located within a site. These are especially helpful in large sites where several pages are clicked through to get to a specific destination page. Breadcrumbs also help visitors through shopping sites as they make it easier to go back to a previous category or page. Breadcrumbs are best used when pages have similar groupings within a site. It would make sense to have unrelated pages within a breadcrumb trail. These are breadcrumbs that show where the visitor is currently (laptops) and how they got to that destination. This not only shows how they got to the destination but they have the ability to easily click back to a previous page if they change their mind. The visitor could easily click back to Computers & Accessories if they decide they want a desktop instead without having to use the back button several times. Let visitors and search engines know what to expect when clicking a link by creating accurate title tags and meta descriptions. These are on display for each site page shown in the search engine results page or SERPS. The purpose of title tags and meta descriptions are to let users know what a page is about before clicking the link to visit the site. You want to make sure you provide accurate information but also want to sell your site above the others that display. You want to ensure your URLs make sense to what the page is about. This is another tool that helps both Google and potential visitors know what to expect when clicking on the link. This URL tells search engines and users this page is about SEO or Search Engine optimization. This also includes the keyword for the page which is helpful in ranking. Having the keyword included in the URL would still be relevant as your page should be structured around a topic including the keyword. This would be a bad example of a URL as it does not specify a general idea of what the page is about. It is just a random set of numbers and symbols. Both search engines and potential visitors would not know what to expect when clicking this link. Internal linking could be a great tool in helping visitors navigate a website as well as spreading ranking power across multiple pages within a site. Keep the internal links relevant to the page. Just throwing a bunch of internal links in a page would not be helpful for the site or visitor. Internal links have to be attached to an anchor text. The anchor text should be relevant to the link that is attached to it. This helps not only in navigation but also with rankings. The anchor text should also be a searchable term – a keyword or keyword phrase. “Social Media Services” tells both the visitors and search engines what the link should lead to. It is also a searched term by potential visitors making it helpful towards ranking the page in the search engine results. “Click Here” tells nothing of what the attached link would lead to nor is it a term someone would search for. This makes it hard for not only the site visitor but also search engines. With the growing number of users searching through mobile devices, it is important to make sure the menu works well with a smaller screen. If you have a responsive site, your menu will most likely resemble a hamburger with three horizontal lines. Our first tip of keeping it simple helps here. Make sure the menu items are listed but not heavy on words. Be descriptive with as few words as possible for the menu as there is limited space – especially when dealing with mobile devices. Links spaced too closely together make navigation through the website difficult for those using a mobile device. All tips mentioned contribute to SEO user navigation. Creating a user-friendly site helps keep visitors on that site as well as encourages them to navigate through it and explore different pages of information. If a visitor were to click on a link and not know how to navigate a site, they would directly leave from the page they entered. This would increase the bounce rate – percentage of people leaving a site from the same page they entered without clicking through other pages. An increased bounce rate informs Google that the page did not contain the information users are looking for which in turn decreases the rank of the page in the search results. This is why you want to attract people to your site and keep them exploring through it. 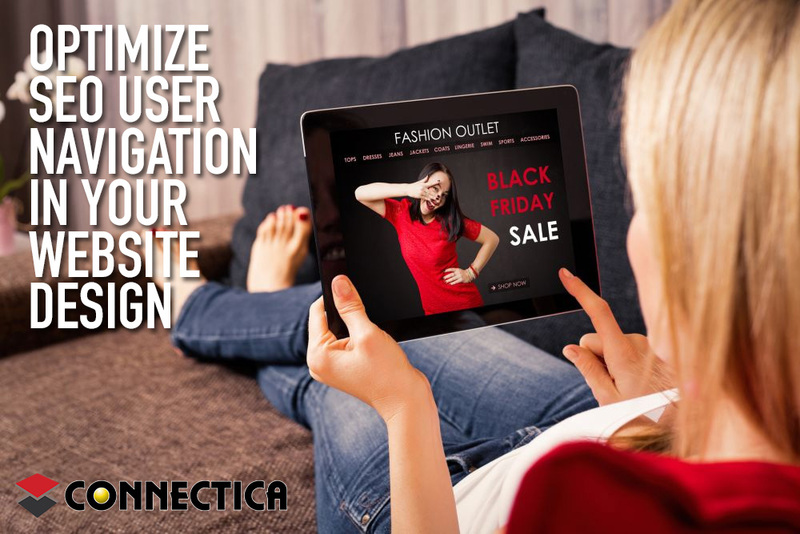 It may be daunting, but a digital marketing company such as Connectica LLC can help you with SEO user navigation in your website design.